Nothing is more important in your life than your beloved spouse. The day that you got married marked the first day of the rest of your life; therefore, it is essential to celebrate such an occasion in the proper manner. Send your loved one a poem from this batch on your anniversary to show just how much they truly mean to you. 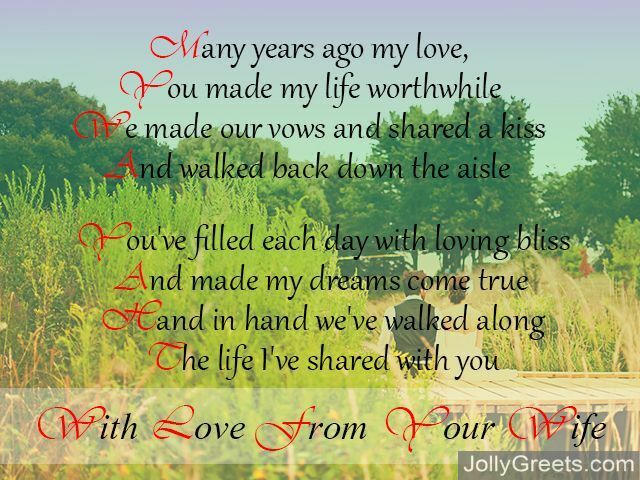 An original, heartfelt poem is the perfect message to show just how much you value your husbands relationship and role in your life. Celebrate your anniversary the right way this year, and send the message that you have been waiting too long to say. Congrats, we made it! Another year. I think it’s cause to celebrate, say? Hurray! It’s our anniversary day! We make it last, me and you. I know I’ll never, ever feel blue. For you it is worth it, all that and more. I love you my husband, and that is so true. I think of all we had been through together. And I know that you love me too. Happy Anniversary my darling. In a world full of pain, it’s so grand to see two people still in madly love. with you by my side we are unstoppable, and with me at your side we can take on the world. I love you dear husband till the end of line. Happy Anniversary. I am the luckiest person in the world, because you love me. Happy Anniversary! they are always filled with laughter. world. Happy anniversary to us!!!! great effect on me that no one has. How I lived my life before. then the passage to your heart. with minutes of laughter and tears. the more time that we spend. to bring his love to you. to have been married on this day. and felt safe in your embrace. and the lilt of your voice. and I have loved you more each day. as I walked down the aisle? and you beamed with such allure. Do you remember me saying “I do”? Because I’m happy that you did too. that you are in my life. I am so happy to call myself your wife. 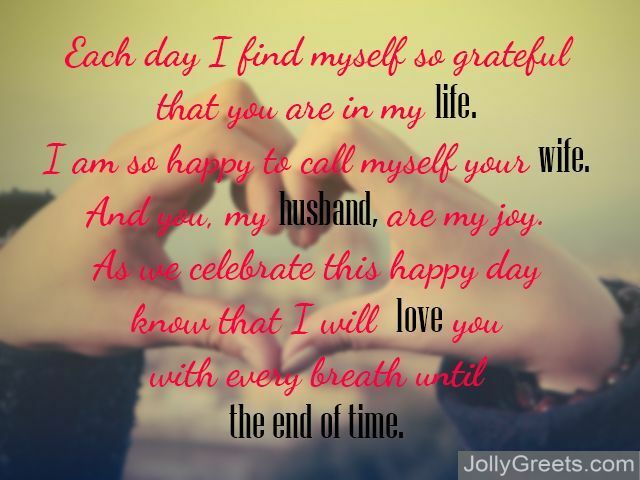 And you, my husband, are my joy. What do you give a man who has given you everything?